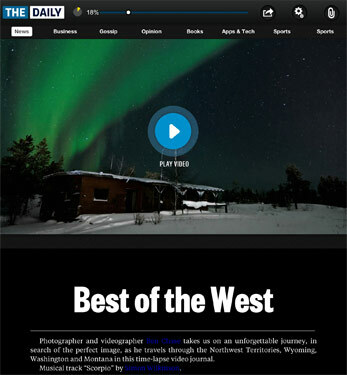 I’m pleased to have my HD time-lapse video, “Surreal Journey” featured on The Daily, by News Corp.
You can find it under the “Best of the West” section! Posted in Blog, Photoblog Articles, Video and Motion and tagged with published, The Daily, timelapse. RSS 2.0 feed.